Showing results for tags 'stereo'. Lower price - $4000 Happy wife happy life.....Too much stuff and have to downsize. I didn't think I'd ever part with it but the day has come. Used, like new McIntosh MC275 VI (from Audio Classics). Have all original parts (including tubes). I am in Northern CA and would like local pickup but am willing to drive and/or ship if it makes sense. Currently has Gold Lion KT88 power tubes and Electro Harmonix pretubes. Asking $4000 Just noticed those ARE NOT scratches on the transformers just dust. I can send more detailed pics via text or email for interested parties. Line-level converter from mains to sub? Hello all, I have a Yamaha R-N303BL stereo receiver I'm using in a room, with the intention of using the B outputs for outdoor speakers. I also have a subwoofer (K100-SW) for that room that I'd like to join in on the fun. The receiver has no sub output (obviously, since it's stereo, not home theater), but it does have line-out, and I figured that would be fine with the LFE/Line-In on the sub (which does not have powered speaker inputs). However, I had not considered that line-out was volume-independent - so the sub volume remains the same regardless of selected volume on the receiver. D'oh! I have seen suggestions of using the B output on a line-level converter, but I plan to use the B outputs for outdoors. I would rather not swap out for a surround receiver for a room with only speakers just to tie in the sub, and I'd rather not swap out the subwoofer for one with L/R powered speaker inputs that then chain off to the L/R speakers, if possible. Would it be viable to connect a line-level converter to the A speaker posts in parallel with the L/R speakers, and use that to connect to the line-level input on the sub? I have seen some on Amazon that are described as being for older radios to hook into a new receiver or something like that, so I'm not sure they're designed to handle this type of scenario - I don't want to let out any of the magic smoke that makes electronics work! So, is there a viable way to run the line-level input sub off the receiver's speaker posts alongside the L/R speakers, or do I need to exchange the sub for one with L/R speaker inputs & outputs? Thanks for any suggestions! Howdy, I am interested in tweaking a pair of RF-63 Speakers and RC-64 for Fullest Stereo Sound. I am using them with a Denon AVR-3310 CI. When I use the center channel in a 5.1 setting(that is the only way the center channel will engage), I lose the dramatic effect of the stereo speakers. I want the fullness of the Direct Stereo setting while using the center channel. Does anyone have any suggestions? Thank you in advance. Item: Jeff Rowland Model 112 amplifier Price: $1,800 shipped (lower 48) SOLD Location: Franklin, PA 16323 Trades: Different amp, amp/preamp combo, integrated? More pics available. Only lets me upload one here due to file size restrictions. PM me. One of the finest quality components to ever grace my rack. This is an amp that looks as good as it sounds. Attention to detail has gone into every step of the design and build process. 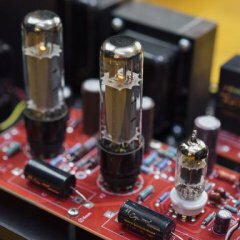 At 150 wpc at 8 ohms and 275 wpc at 4 ohms, it has the power to drive just about any speaker available. The sound is smooth and inviting, yet detailed and articulate. The amp is in excellent condition overall with just a few very minor rub marks on the aluminum chassis (hence the conservative 7/10 rating above). Detailed photos available to interested parties. Amp will ship in its original box and packaging. Owner's manual is included. Todd Warnke at SoundStage sums up the Model 112 here:"In all, the Rowland Model 112 is the definition of jewel-like mass. Everything about it is designed with careful thought, attention to detail, and with a music-lover's heart. The tonal response -- full, accurate, but tight and extended on bottom; mids that are detailed if just a whisper lean; highs that are extended, sweet, detailed and grain-free -- leads to hours of inviting, fatigue-free listening. The limitless power of the Model 112 allows listening to anything, from after-hours ambient to full-scale orchestra. Sonic cues and musical detail are ample, if not quite to the level of the super amps (and Rowland has several of those to offer you should you have the budget). And the Model 112 presents a stage that is wide, deep and stable. All this combines to create a slightly laid-back character that makes for an easy long-term partner.This is an amp that's exquisitely honed to do a difficult job with unflappable control. It never runs out of steam, it goes all the way to the bottom of the musical scale with as complete composure as it goes to the top. It digs deep into a recording and delivers the goods without edge or glare. Add in a design that simply beautiful and you have an amp for people who appreciate quality, will pay for it, and then settle down for the long run with their choice....Todd Warnketodd@soundstage.com"FEATURES· XLR input connectors for balanced (Differential Modeä) system configuration.· RCA input Connectors for unbalanced system configurations.· Selectable overall gain of 26 or 32 dB.· User selectable switching between balanced and unbalanced connections.· 12V remote ON/OFF power switching connector.· Automatic temperature stabilizing circuitry maintains constant operating temperature.· CE approved speaker output connectors requiring no tools for tight connections.· Automatic bias adjustment maintains optimal bias setting regardless of source material or loudspeaker load.· Standby power condition reduces warm-up time.· Fail-safe operation provided by user-resetable thermal circuit breakers located on rear panel.· Quiet, transient-free operation during power and function mode switching.· Automatic input muting under anomalous input or output operating conditions.· Fully-balanced Differential Modeä circuit topology implemented from input to output.· Low resonance, structurally integrated chassis constructed of precision-machined aircraft grade aluminum.SPECS· Output Power:· Continuous RMS watts @ 8 ohms 150 watts @ 4 ohms 275 watts· Power Bandwidth: DC to 160 kHz, -3 dB·· Slew Rate: 30 volts/microsecond· THD + Noise: <.008%· Damping Factor: >60, 20 to 20 kHz· Gain (1 watt, 8 ohms): User Selectable Internal Jumper, 26 dB or 32 dB· Input Impedance: 40k ohms· Common Mode Rejection Ratio: >80 dB, 20 – 20 kHz· Absolute Phase: Phase-Inverted· Power Supply: 500 VA toroidal transformer with 100,000 MFD total storage capacitance. Regulated frontend supply.· Power Consumption: 75 watts idle, 700 watts maximum Both Channels Driven Simultaneously at Full Output Power· Inputs: User Selectable, 2 x Balanced XLR, 2 x Unbalanced RCA· Outputs: One Pair Binding Posts per Channel· Dimensions: 17.5” W x 11.7” D x 5.2” H· Weight: 55 lbs.· Shipping Dimensions: 24” W x 22” D x 13” H· Shipping Weight: 65 lbs. Hi gang, I was going to set this amp up in my daughter's bedroom but she really doesn't have much interest in it so I am going to sell it instead. I would rather see it go to a new home than sit in a box.UPA-200 - Brand new never opened. I have opened the outside double box but never the inside box so it is still factory sealed. $300 shipped with insurance to the CONUS. I prefer Paypal gift but may be able to work with you. I have bought and sold plenty here in the forum so you can feel confident in this transaction. Private Message me if you need anything!Thanks, TimFeaturesA true audiophile-quality stereo amplifier.Advanced engineering with SMD gain blocks.Wideband, short signal path, class A/B design topology.Top quality parts and construction.Real power easily drives complex loads.Heavy-duty power supply with oversized toroidal transformer.Gold plated five way binding post speaker terminals.Gold plated RCA input terminals.Classic Emotiva styling with rugged solid steel chassis.15mm solid milled aluminum faceplate.Channel status LED’s. (which can be disabled in stealth mode).Remote trigger input and output.115 VAC or 230 VAC with automatic detection and switching.Full protection from all common input and output fault conditions.SpecificationsTopology: Fully discrete, dual differential, high current, short signal path Class A/B.Number of Channels: 2Power Output (rated power; THD < 0.05%): 125 watts / channel (8 ohms; all channels driven).200 watts / channel (4 ohms; all channels driven).Rated Power Bandwidth (at rated power; 8 Ohm load): 10 Hz to 20 kHz + / - 0.1 dB.Minimum Recommended Load Impedance: 4 ohms (which equals one 4 ohm load or two paralleled 8 ohm loads per channel).Frequency Response: 5 Hz to 80 kHz + 0 / - 2 dB.THD + N: < 0.03%Signal to Noise Ratio (8 Ohm load): > 92 dB at 1 watt (A-weighted).> 106 dB at rated power (A-weighted).Damping Factor (8 Ohm load): > 500Speaker Output Connections: Full-sized 5-way binding posts; one pair per channel x 2.Power Supply: 350 VA high current ultra-low noise toroidal power transformer.40,000 uF of storage capacitance.Input sensitivity (for rated power; 8 Ohm load): 1.1 V (for full output; 8 ohms).Gain: 29 dBInput Connections: Unbalanced (RCA); one per channel.Input Impedance: 47 kOhmsTrigger: Trigger Input: 5 - 20 V (AC or DC); < 10 mA input current required.Trigger Output: 12 VDC; can drive any load up to 50 mA.Power Requirements: 115 VAC or 230 VAC +/- 10% @ 50 / 60 Hz (automatically detected and switched).Front Panel Controls and Indicators: Standby; push button (changes color to indicate Standby or On).Status LEDs (one per channel); illuminate blue for normal operation or red to indicate a fault (may be disabled by rear panel Status LED switch). Emotiva introduces a new line. thought i would share some photos i captured of jonathan wood's loft setup. enjoy!